Amazon has the Angel Soft Toilet Paper, 48 Double Rolls for just $19.23 when you clip the $1 off coupon where is says “Clip Coupon” and click on “Subscribe & Save” on the right hand side. And it’s shipped FREE right to your door! 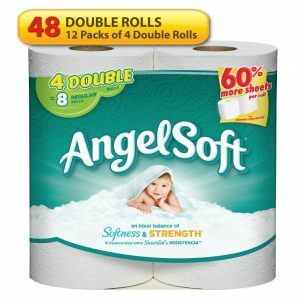 Since 48 double rolls equals 96 single rolls, the price comes out to be $0.20 per single roll, which is a good price. Plus, you don’t have to leave your house.